JAMES E. RICE is a principal of Brody Wilkinson and is a member of the firm’s Business Group. Mr. Rice practices in the areas of utilities and energy, business and finance, and commercial real estate. He represents energy companies and other clients before the Connecticut Public Utilities Regulatory Authority and the Connecticut Siting Council. Mr. Rice has acted as Connecticut counsel in connection with the acquisition of major power plants and of regulated public service companies. He also serves as outside general counsel to several small- and medium-sized businesses in the Fairfield County area. Prior to joining Brody Wilkinson, Mr. Rice was a partner at the former Southport law firm of Marsh, Day & Calhoun. He is admitted to practice in Connecticut, Michigan, the U.S. District Court for the District of Connecticut, and the U.S. Court of Appeals for the Second Circuit. Mr. Rice is a member of the American, Connecticut and Greater Bridgeport Bar Associations. He serves as a member of the Standards of Title Committee of the Connecticut Bar Association and as a member of the Executive Committee of the Public Utility Law Section of the Connecticut Bar Association, for which he also served as chairman. Mr. Rice has been selected for inclusion in The Best Lawyers in America© in the field of energy law since 2006. He is a Martindale-Hubbell AV-rated attorney. Mr. Rice received his B.S. from Fordham University in 1965 and his J.D. from the University of Michigan Law School in 1968. Active in civic and charitable activities in the greater Bridgeport area, he served as an assistant town attorney for the Town of Fairfield from 1993 to 1997 and as a member of its Historic District Commission until 1993. Mr. Rice is a member and past president of the Bridgeport Kiwanis Club, and served as president of the Fairfield Beach Club. He serves as a Board member of Fondazione Centesimus Annus Pro Pontifice, a Vatican-based organization of lay business and professional leaders, and is also an officer and director of the U.S. chapter of this organization. Mr. Rice previously served as president of Catholic Charities of Fairfield County. In recognition of his work for Catholic Charities, he was named a Knight of St. Gregory the Great by Pope John Paul II. 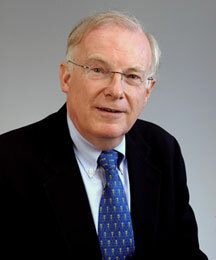 Mr. Rice has also served on the Advisory Board of the Gallery of Contemporary Art at Sacred Heart University, the Board of Directors of the Fairfield County Children’s Choir, the Board of Directors of the Fairfield County Chorale, and the Institutional Review Board and Clinical Ethics Committee of St. Vincent’s Medical Center. He resides in Fairfield, Connecticut, with his wife, Candy.